I read an article recently that said that studies had proven that Oreos are more addictive than cocaine. How true that is, I don't know - they have been my favourite go to cookie as long as I can remember but addiction? No way. 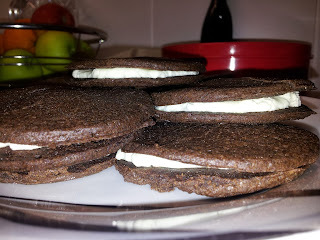 When I saw this recipe in Vegan Cookies Invade Your Cookie Jar I had to try it. Something that promised to be better than my favourite cookie, but without a ton of ingredients I can't even pronounce? Yes please! It didn't disappoint. I must admit I was a little disturbed by the wetness of the dough. However don't fret! It all turned out just fine. * I had no idea what vegetable shortening was, until I purchased this book. I found it almost impossible to find in Lisbon, the only place in the end being Glood, an awesome store that imports foods from all over the world! ** I changed this from the original recipe, that asks for two different types of cocoa because I have no idea where to buy different types of cocoa! Make sure you have plenty of baking paper ready before starting! - Cream together the shortening and sugar with a hand mixer until light and fluffy (about 1 minute). Add the vanilla extract and non-dairy milk and mix some more, until all is combined into a smooth mixture. Add the dry ingredients and mix until you have a uniformly textured dough (like I mentioned before, it will be very wet and sticky!). Put in the fridge to chill for around 10 minutes, and pre-heat your oven to 175ºc in the meantime. - Place a sheet of baking paper, the size of your cookie sheet, onto your surface. Divide the chilled dough into two (put one back in the fridge) and roll one half into a ball. Flatten it into the centre of your baking paper, and cover it with another sheet to stop it from sticking to the rolling pin (magic!). Roll out until the dough is almost the size of your cookie sheet (it should be about 3mm thick) and carefully remove the top layer of baking paper. Cut into whatever size you wish using a round cookie cutter, or the upturned end of a clean glass (I used a glass, making mine about 6cm across! ), leaving around 1cm between each cookie. Carefully peel off the leftover dough, and put back into the fridge. - Transfer the whole sheet of baking paper with the cookies to the cookie sheet, and bake in the oven for around 12 minutes. Take them out and leave them to cool for 5 minutes on the sheet, before carefully transferring them to a wire rack to fully cool. Be very careful, they won't seem very firm at this point! - Repeat with all of the remaining dough, preparing the filling while one of the batches is in the oven. - Cream the margarine and shortening together using a hand mixer. Add the sugar in 1/2 cup increments until a very firm, but smooth mixture is formed. Add the vanilla extract and mix until combined. Chill in the fridge until you're ready to use it. - Once the cookies are cooled put half of them onto a flat surface. Roll your filling into balls around the size of large grapes and squash each ball onto each cookie. Top them with the remaining cookies and squash together until the filling more or less reaches all the edges. Store in a tightly sealed container.